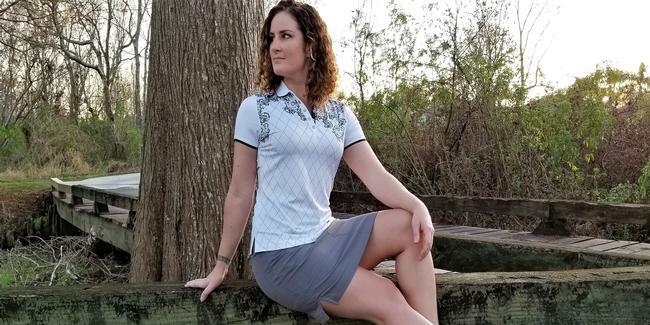 For their 2018 Spring Collection, Callaway has created some pretty impressive pieces for men and women. All of the pieces we looked at feature Callaway's Opti- Dry moisture wicking technology, designed to pull sweat away from the body and keep you drier longer. All are machine washable and fairly easy to care for. Callaway's shorts have always been some of my favorites and this spring is no exception. Their Men's Stretch Madras Paid Shorts feature an active waistband that enhances your level of comfort and the gripper tape keeps everything in place and your shirt tucked in. 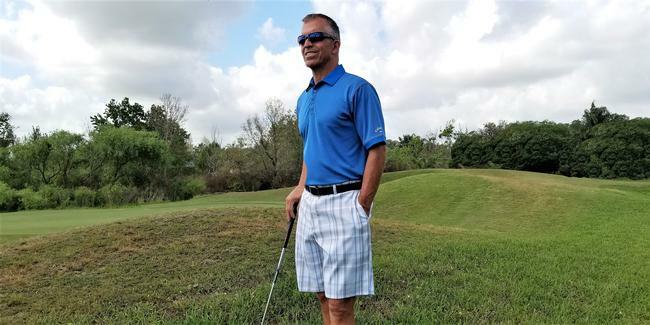 The 95% Polyester/5% Spandex stretch fabric is created with interwoven layers of spandex that ensure maximum range of motion and moves with you through every phase of your golf swing. A UPF 50 finish keeps the sun's harmful rays at bay. Two front and back pockets are deep enough to keep valuables and most scorecards safe and secure. The plaid pattern is comprised of smaller checks that run horizontally and vertically in an all-over pattern on the shorts and the color combinations are not overpowering. The Callaway Tour logo is embroidered above right back pocket. The Stretch Madras Plaid Shorts are available in sizes 30 - 42 in either Bright White or Liberty, with a retail price of $75. On those cold spring morning, you'll want something to keep your upper body warm, at least on the front nine. Callaway's 1/4 -Zip Chest Stripe Jacquard Sweater is just the thing and the 50% Acrylic/50% Merino Wool fabric is softer and more versatile than any similar fabric. 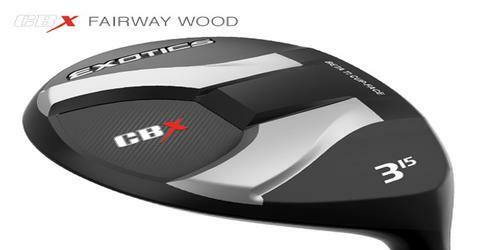 It's exceptionally lightweight and designed for warmth with Callaway's Opti-Therm technology. The 1/4 -Zip Chest Stripe Jacquard Sweater features a ribbed mock collar as well as ribbed cuffs on the sleeves. There's a Callaway Chevron logo on the left sleeve cuff in case anyone 's wondering who made this wonderful garment. It's available in sizes S - XXL and in either Granite Heather or Night Sky Heather. The 1/4 -Zip Chest Stripe Jacquard Sweater retails on the www.CallawayApparel.com website for $100 but can currently be purchased at a 40% savings, meaning you should probably buy both colors. Light-hued horizontal stripes set the tone for Callaway's Ventilated Engineered Stripe Polo, giving it a clean, stylish look that can be worn at work or on the course. The ventilated fabric is engineered to keep you cool by circulating air through the garment and works in conjunction with their Opti-Dri technology. This polo features a ribbed collar and classic golf three-button placket and the iconic Callaway Tour logo on the left sleeve. The stripes move closer together through the chest, being separated by two thin colored stripes on the top and bottom. The Ventilated Engineered Stripe Polo is available in sizes S - XXL and in either Bright White or Liberty. Retail price is $70. Another high-quality polo from Callaway is their Opti-Dri Road Map Stripe Polo which offers UPF 50 protection against the sun's harmful UV rays. The 95% Polyester/5% Elastane fabric has plenty of stretch, providing full range of motion and Opti-Dri helps you stay dry and cool. The ribbed collar and three-button placket are all golf and the Callaway Tour logo on the left sleeve identifies the brand. The thin yarn-dyed horizontal stripes flow around the shirt and the alternating colors create a vibrant pop that is sure to have your opponents doing a double take. The Opti-Dri Road Map Stripe Polo is available in sizes S - XXL and in Bright White, Caviar or Salmon. It's also available in Big & Tall sizes too. Retail price is $70. 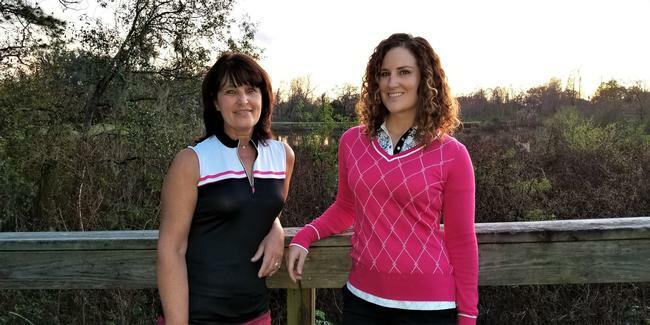 Callaway has gone a long way to help women look and feel their best on the golf course with a couple of new polos. The front and back of the Opti-Dri Color Block Polo are a different color than the sides and back shoulders, and the highlighting trim on the sleeve hems, collar and placket create a 'wow" factor. The five metallic logoed snap placket lets you decide how much sun you get, while the UPF 50 finish helps keep the sun at bay. There's plenty of stretch in the fabric and the contrasting Chevron logo on the center of the back collar identifies this exciting polo. The Opti-Dri Color Block Polo is available in sizes XS - XXL and in Caviar. Retail price is $65. If you want more color block and less sleeves, check out the Opti-Dri Color Block Sleeveless Mock Polo. The color blocked pattern is created by separating the front chest from the remainder of this mock-necked polo and adding a single chest stripe to create pops of color. The black mock collar has a ¼-zip placket and the 95% Polyester/5% Spandex fabric moves with you, with no pinching or binding. As always, the UPF 50 finish keeps you protected from the sun. A tonal embroidered Callaway Chevron on the center back of the neck, tells your playing partners your preferred brand. The Opti-Dri Color Block Sleeveless Mock Polo is only offered in Caviar with a splash of Pink and in sizes XS - XXL. Retail price is $60. The space dyed fabric in the 17IN. Stretch Shooting Star Skort goes a long way in creating a unique look that chicks with sticks will enjoy! The space dye fabrication strings together multiple colors of fabric into a single strand, creating an all-over pattern with alternating colored finishes. The 95% Polyester/5% Elastane ventilated fabric is extremely breathable with extra stretch to get through every facet of your golf swing without pinching or binding. The 17" length and ventilated 4-way stretch mesh liner shorties create a modicum of modesty. The 17IN. Stretch Shooting Star Skort features two front pockets and a back scorecard pocket with a reflective silver Chevron above it. This garment is available in Pink Yarrow in sizes XS - XXL and has a retail price of $75. On those chilly spring mornings, Callaway's Thermal Lightweight Quilted Vest may be just the outerwear piece you're looking for. The rectangular quilting is sewn on the front and back and a two-way zipper allows you to zip from the bottom and top. The insulated thermal fabric creates a barrier between you and cold weather, letting you concentrate more on your next shot and less on keeping warm. The Thermal Lightweight Quilted Vest features a mock collar and full-zip design with two zipped front pockets. The pulls on all three zippers feature the Callaway logo and if that's not enough, there's a reflective silver Chevron logo on the center of the neck in back. This vest is available in sizes XS - XL and in 4 colors: Pink Yarrow, Blue Radiance, Bright White and Peacoat. It's quite a bargain at $90. If you're a gal who favors cold weather and likes to make a fashion statement, then the Argyle Jacquard V-Neck Sweater could quickly become your go to cold weather piece. This stunning sweater is sewn for Callaway's 53% Cotton/40% Viscose/7% Nylon fabric and features a ribbed V-neck with white trim and white trim on the sleeves. There's a tonal embroidered Chevron on the right sleeve, above the cuff. The diamond argyle pattern is constructed from a slightly textured jacquard fabrication and encompasses the front of the sweater. The Argyle Jacquard V-Neck Sweater comes in sizes XS - XXL and in Pink Yarrow. Retail price is a scant $80. This is just a sample of what's available from Callaway Golf Apparel for the 2018 Spring season. To see the rest of what they have to offer, visit their website at www.callawayapparel.com.